Thank you so much, TK for taking the time to spend with all of us at BOD! BOD is already such a fun place, but it’s so lucky to have your funny, witty addition, so thank you! Aw, thank you so much! I adore this group. I know when I peek at the posts, I’m about to be highly entertained. It’s a super fun place to hang out and just be myself. Before we chat about your book(s), can you share a little bit about how you got into writing? When did you know you wanted to be a writer, and how did it all come to be? Now tell us a little about your dystopian books. Collapse is the first in the series. And it has the perfect back drop for the kind of stories BODers crave. I love that it explores the possibility of a future America dealing with totally realistic issues that are kind of being experienced now. Can you tell us more about it? Collapse stemmed from an uneasy feeling I had when I filled out the 2010 census. As I dropped it in the mail, I thought, “I just put all my demographic information on one piece of paper and mailed it to the government. What would happen if they don’t use that information for my good?” Tess’s story line blew wide open. In the book, Tess is a forty-year-old widowed woman living in a small town in Missouri raising two teenaged daughters and working as a nursing home administrator. She’s just received notice that she’s been selected to participate in a government test program called REEP (Redistribution for Economic Equivalency) and may have to swap houses with a larger family. The same day, she’s notified that the government has cut all Medicare/Medicaid funding for nursing home residents and is ordered to shut the home down even though some of the residents have no family and nowhere to go. So I had Tess, but I wondered how America got in this position to begin with. Enter Doug. Doug is a fuel truck driver whose job is in high demand since the Middle East cut off all fuel supply to America. This caused the powers that be to create fuel vouchers and allocation programs in order to better manage what fuel remained. Doug allowed me to show the devastation and panic brought on by supply trucks failing to deliver food and supplies to grocery stores. He also let me explore the non-heroic side of a character. He’s a good guy – a normal man with a good heart and kind spirit. I’m tired of Hollywood putting normal people in devastating, catastrophic events and having them all thrive. So what happens if you put a good guy in a bad situation, and he doesn’t handle it well? The last character to form was Brenna, a ten-year-old girl from central Missouri who’s excited about her once-a-year free plane ride to see her dad in Richmond. Her story shows how rough things have already gotten in other parts of the country and sets up a large part of book two, Three Meals to Anarchy. Do you think that America could really fall apart as literally as it does in Collapse? Collapse embodies some of my worst fears for the country. (Hence the series title, “The Yellow Flag Series.” A yellow flag means caution on a race track, sickness on a ship, and a penalty on the field.) When I wrote the first two books, no, I never thought any of it could truly happen. Over the last five years, though, now I’m a little unsettled. I wrote Collapse before I knew anything about ObamaCare or other policies that have since been enacted. Several of my readers have questioned if I have some kind of future-telling abilities, and every time I hear that, I’m sick inside. God, I hope this doesn’t happen to our country. Besides your dystopian stories, what other stories have you written/are you writing? In addition to your own stories, what can you tell us about your involvement with BOD’s upcoming anthology? 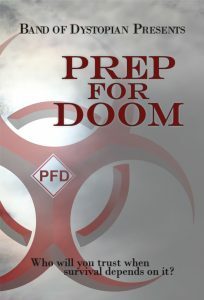 I’m thrilled to be a contributing author in the novel, Prep for Doom. When the call for submissions came, I knew this was something I wanted to do, so I tabled The Breakup Mix long enough to work up a submission. I was elated when my story was chosen, but I was blown away when I read all the other stories and completely humbled to be included with these brilliant minds. What has it been like to collaborate with other writers in creating such a unique project? This has been an awesome experience for me. I’ve never done anything like this, and truthfully, I’ve never been fond of group projects. (It’s the Aries in me.) But this has been phenomenal. I think my favorite part was when we were all reading the first draft together and posting right and left about it then doing an author reveal. I’ve made some great friends and had a ton of laughs over the last several months. Now share with us some fun, random info about yourself. You have an infectious, humorous personality. Where did you get it from, and what do you do to always see humor in the world? My whole family is quick-witted and full of life, so I have to give credit to genetics on part of it. Some people say I ate my twin in utero, and that’s why I have double the personality. (Thanks, sister.) I’ve always liked to make people laugh and find the humor in situations, but it really became an invaluable character asset after my divorce. I made a decision in 2010 that I could either laugh about things or cry and let the world overtake me. I was going through some really hard times and trying to figure out how to be a single career mom and homeowner and not be squashed by it all. So I started writing a blog called My Ms.Adventures to share my experiences and find the humorous twist so I could cope. It worked wonders for me and has become widely popular. And, I’m constantly having some crazy-funny stuff happen to me. I’m like a magnet to the unusual. What is the craziest, or funniest thing you’d like all of us at BOD to know about you? When I was a kid, I wanted to do character voices for Hannah-Barbara or Disney when I grew up. (Along with all the other careers I’d planned: attorney, journalist, waitress, etc.) I started mimicking the voices of people on television and developed a talent for various impressions. (Gizmo, Scooby Doo, Bungee, then later came Cartman, Linda Richmond, and several I just made up on my own.) It’s not uncommon for me to quote movies or bust out different voices during normal conversation- often it’s unplanned and unexpected to everyone, myself included. Would you like to share about any future writing projects you’re doing, and give us a heads up of some things we can look forward to? I’m currently working on book three in the Yellow Flag Series, which is due out this summer. (I hope.) After The Breakup Mix, I’ve had a bit of a book hangover and haven’t been able to write much for nearly two months. Having three other women take over your mind for seven months can jack you up, apparently. But, I’m plugging along and hope to launch late summer. Thank you so much for sharing yourself with us and for making BOD a better place! Thank you from the bottom of my heart for this group and for all the joy it brings me. I’m grateful for the opportunity to share this side of me with you. Thanks! 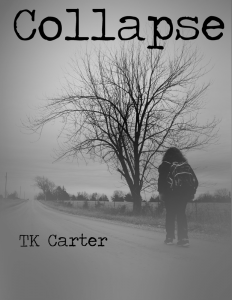 Learn more about TK Carter on her website. 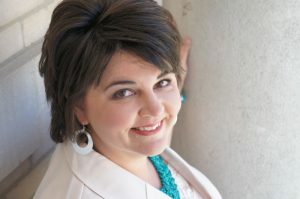 and connect with her on Facebook, Goodreads, or Twitter.